We create educational materials that explain what nutritional food is, why our bodies need it and how to grow and use it. We focus on what are often neglected and underutilized plants, plants that are growing in and adapted to their environment, and are high in the most beneficial nutrients. Our materials are designed to empower people, but particularly women, so that they can make informed choices on what plants to grow and eat that will nutritiously feed themselves and their families. This project is cost effective, proven to work, sustainable and enables self-sufficiency. We can end malnutrition – it’s as simple as growing the right plant in the right place. Learn how you can establish a Food Plant Solutions program to address hunger, malnutrition and food security. With program partners, Food Plant Solutions encourages the establishment of food gardens in schools and communities. Our partners have proven that these provide ongoing education and improve the health and nutrition of all participants, with malnutrition reduced by as much as 95%. The first 1000 days from conception are critical in a child’s development. Malnutrition and other serious health problems, such as blindness, intellectual disabilities, anaemia and impaired growth can be due to nutritional imbalance in the diet. The real hero in our story is Tasmanian agricultural scientist and Officer of the Order of Australia recipient – Bruce French. 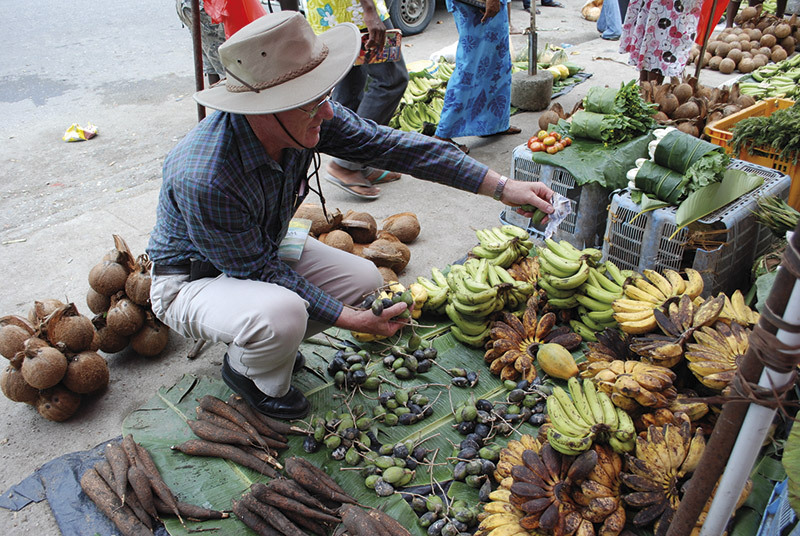 Bruce worked in Papua New Guinea in the 1970’s teaching people about agriculture – primarily western food plants and western technology. Bruce’s students were more interested about their own local plants but there was little information available about them. Bruce decided to write about local plants and eventually developed a database of all the edible plants of all the countries of the world as a resource to address hunger, malnutrition and food insecurity. More than 40 years later he has a database of over 30,000 edible plants which includes information on each plant, its food value, how to grow, what parts are edible and how to use those parts. The continued development of this project is dependent on committed, enthusiastic volunteers with a wide skills set. Join Food Plant Solutions Rotarian Action Group and become an ambassador for the project. Talk with us about how the vision of the Food Plant Solutions project can be shared with your club, network and the wider community.